The Dirtbombs new record, Party Store, is a collection of nine covers from the Detroit techno scene of the 1980s— all done up Dirtbombs style with fuzzed out guitars and attitude. Good stuff to be sure, but more than anything it prompted my revisiting the band’s unfuckablewith, second album, Ultraglide In Black. 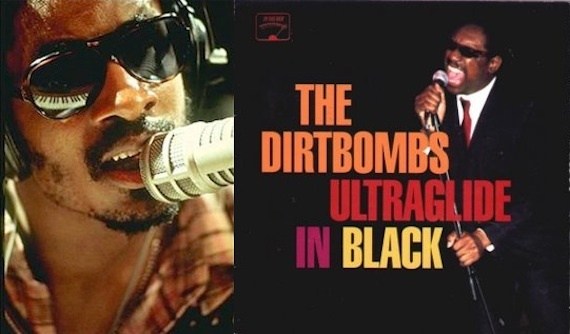 Released in 2001, Ultraglide found the Dirtbombs taking on and paying tribute to sixties and seventies soul and r&b legends (Curtis Mayfield, Marvin Gaye, Stevie Wonder, Smokey Robinson, etc) while injecting a raw dose of Detroit Rock City into the mix. The below cut is their take on Stevie’s “Livin’ For The City“—and if you’re feeling this taste, you need the entire LP in your life. Can’t believe it’s been 10 years. “Chains of Love” blows you away out of the gate and “Ode to a Black Man” is tops. I don’t think we will be talkin about Party Store in 10 years, but if we are that won’t be a bad thing. “Unfuckablewith” about says it. Classic Detroit rock ‘n soul. one of my favourite tracks from an absolute gem of an album. talk about “unfuckablewith,” i actually pulled out ‘if you don’t already have a look’ out last week. their take on “no expectations” is still the best.